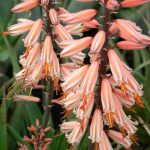 Any rockery will benefit from the presence of this medium-to-large aloe with its green leaves and striking red-to-white flower racemes. 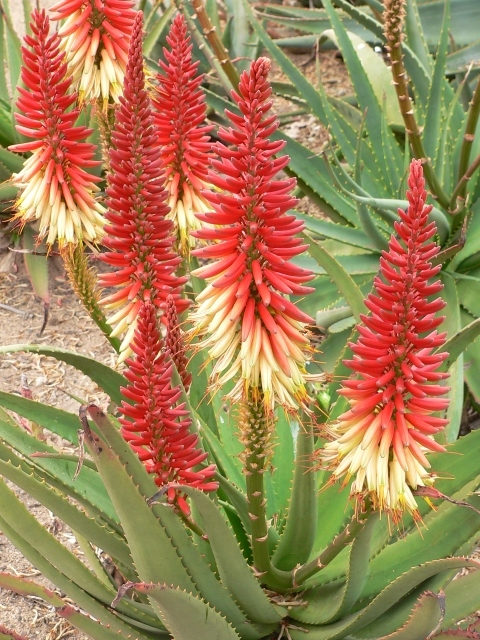 It not only has a long flower season – mature plants typically produce a first inflorescence in late summer. This is followed by the main flower display during the winter months. The multiple inflorescences are branched, with upright bi-coloured racemes. The short stemmed plant has rather long leaves lined with smallish spines. It may divide the rosette when it reaches maturity and occasionally produces a stem shoot. 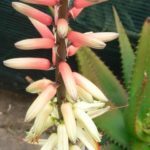 Provided the grower likes his aloes to cluster (form a clump rather than growing single stemmed), two or three of these shoots could be allowed to grow to flowering size. This will add volume to the flowering performance. Alternatively remove shoots by cutting close to the main stem in order to achieve a tall-stemmed specimen plant. 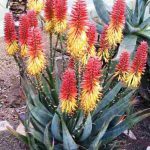 ‘Apollo’ prefers open planting and is not ideally suited to a pot or container. A small grouping makes for a nice landscaping feature.